If you subscribe to my blog posts by email or follow closely, you've got to be an adventurous eater, right? This dish is spicy and full of flavor, and cost about $3 to make. It was also quite filling. 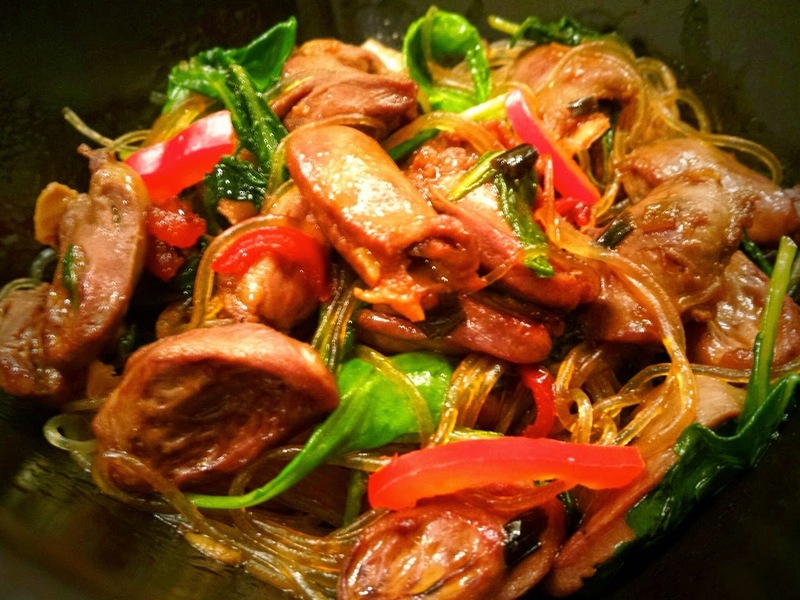 I grew up eating organ meats in many dishes that my mother made. Congee was one that would be full of things with interesting textures, full of things like chicken heart or beef tongue or beef heart. We were sitting at Smallwares in Portland one Sunday for brunch when my daughter asked what congee was. I described it as a kind of rice soup. I knew it was one of her dining considerations because it featured Chinese sausage, one of her favorites. When the dish arrived, she asked if it was porridge. I said sure. I told her about the congee that her grandma used to cook for us. She enjoyed her dish very much, and when our server took it away, she commented that it had been a very mature decision on my daughter's part. Well, I've been talking to Gianna like an adult since she was a baby, so by the time she turned 3, she was talking back to me like an adult. Once a stranger at Barnes & Noble started laughing because they heard her say, "I want this book but it's out of my budget." It sounded so adult from a tiny 3 year old with a raspy voice. So we were at Albertsons one day, and she saw a package of chicken hearts. She said she wanted to try it. I Googled chicken heart recipes, and learned that they're extremely nutritious. I especially enjoyed this lady's take: Organ Love. At another site, the author said she liked to eat organ meat twice a week: South Beach Primal. This is why I love talking to my chef friends who have lived or travelled around the country or the world about food. Some of them have shared accounts of really diverse tastes that they've tried, which really tickles me. And some of them have created the most original taste combinations that also have inspired me to cook a good variety of food as a home cook for my family and friends. I'm so thankful for my 11 year old daughter and her adventurous palate, too! She also inspires me! Combine the first 6 ingredients in a bowl and whisk to combine. Set aside. Cook the glass noodles briefly (about 3 minutes), drain, then add back to the pan until the moisture evaporates from the noodles. Heat a pan over medium high heat, add some oil, then add the garlic and fresno pepper. Add the hearts. Toss to brown all sides, about 4 minutes. Add the chili oil mixture. Add kale and noodles. Toss to combine.